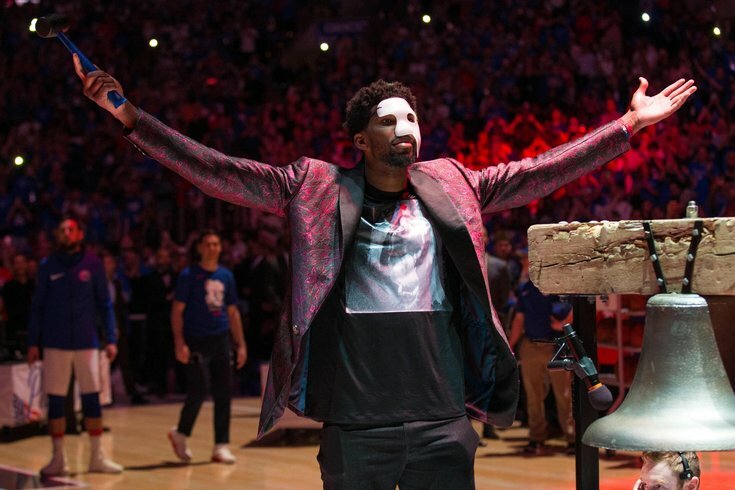 Philadelphia 76ers center Joel Embiid wears a phantom of the opera mask as he rings the ceremonial bell to start a game against the Miami Heat in game one of the first round of the 2018 NBA Playoffs at Wells Fargo Center. Philadelphia's first playoff basketball game since 2012 had everything — Allen Iverson and Lil Uzi Vert sharing a warm embrace courtside, Joel Embiid in a Phantom of the Opera mask, and deafening, arena-wide chants of "Trust the Process!" before the game was even close to tip-off. Sixers mailbag: Will Sixers be prepared for playoffs following easy closing schedule? Oh yeah, they played a basketball game too, and the Sixers proved to be the better team by a wide margin over the course of 48 minutes at the Wells Fargo Center. A 130-103 victory served notice not just to the Miami Heat, but the rest of the Eastern Conference that the young Sixers are not content to settle for being good eventually. They have the right to feel they can grab this sport by the neck right here and now. It all started, weirdly enough, with the man whose ability has probably been questioned more than any other figure with the team over the last half-decade. Down 60-56 at the half, the first 24 minutes of Saturday night's game were decidedly tilted in Miami's favor. If styles make fights, the first half was everything the Heat could have asked for — lots of stopping and starting, little transition success for Philadelphia, and lots of fouls piling up for Philadelphia's key players. When they reconvened at halftime, Brown made an important decision by inserting Ersan Ilyasova into the starting group, despite Ilyasova having an erratic, often damaging first half. "We all had a gut feel of different things, some of it was generated with the mismatch desire with Ersan [Ilyasova] and [Hassan] Whiteside, some of it was generated because we felt we'd like to pair Amir [Johnson] with [Kelly] Olynyk," said Brown. "You made the decision, and we were lucky it helped us ... it certainly changed the game for us." No kidding. The Sixers ran off a 34-18 quarter in the third and the Heat never got close again. The aforementioned Whiteside — he of the four-year, $98 million contract — was taken out of the game and never returned after the 7:54 mark of the third quarter. It was immediately apparent why as it was happening in real time, even if the Ilyasova substitution seemed a little strange after his first half of play. Whiteside had absolutely no interest in defending out to the three-point line, and with the Heat struggling to get him involved on offense he just completely checked out of the game. It's often an oversimplification to say defense is just about effort. But if you can't even be bothered to pay attention to JJ goddamn Redick on the perimeter, you are not going to have a whole lot of success. What makes this Sixers team so scary in its current form is two-fold: they have the sort of passers who are able to exploit these cracks in a defense, to see over the defense and hit guys at exactly the right time. But beyond that, they now have the shooters to believe that once they get into a good groove, there's really nothing you can do to stop them. Heat coach Erik Spoelstra said as much on Saturday night. He downplayed the move to pull Whiteside from the lineup and emphasized Philadelphia's role in dictating the flow of the matchup. "The game has to be on more of our terms" said Spoelstra. "You do have to credit them. They shot the heck out of the ball. Redick and Belinelli were coming full speed off of screens and we did not handle that with any type of force or physicality. We were late to the game on those plays time and time again. That simply has to change on Monday." Marco Belinelli has gotten plenty of love around the city over the last month, and for good reason. It doesn't really matter how difficult the shots he's taking are if he's knocking them down, and right now it feels like every shot that comes out of his hands is money. You can defend plays as well as you'd like, force guys into making errors, but good offense is always capable of beating good defense when the goal is 10 feet in the air. Ben Simmons made a rare passing error late in the game, and Belinelli turned what could (and perhaps should) have been a turnover into a ridiculous made three. The majority of the Sixers' makes, however, are not coming out of plays like these. They're the product of unselfishness, ball movement, screens and back screens, a teamwide emphasis on forgoing good shots for great shots. "This is sort of how we've played since [Joel Embiid] has been out," said JJ Redick, moments after dropping a game-high 28 on the Heat. "It creates a lot of problems for the defense because there's a lot of times where we're playing Ersan and Dario [Šarić] together at the four and five and the other two wings are shooters and you've got Ben [Simmons] going downhill. If it's an open floor you've got to make a choice and it’s pick-and-pop, two-man, catch and shoot. There are all sorts of problems." Speaking of Redick, I'm not sure it's possible that we can give him the credit he deserves as a screener. Frankly, a lot of it is probably illegal, but if there's a segment of the sport where you can thrive in the gray areas, it's in the screening game, where players have built Hall of Fame careers around mauling players on picks. In the beginning of the year, it was hard to use Redick too much as a screener because the team felt dependent on him shooting well from deep. With the emergence of Saric and the additions of Belinelli and Ilyasova, the Sixers are free to unleash Redick as both a weapon and a decoy. There was one particularly crafty sequence early in the fourth quarter where Redick essentially screened his own man coming off a curl, only to step into a second screen on Justise Winslow and free up Saric for a made three. The shots are not always going to fall, but the little things add up eventually. The Sixers should believe they can hit threes at a sustainably high level, and it will be tough for Miami to keep up if that's the case. The only blemish in an otherwise tremendous playoff debut for Simmons was his inability to finish in close. Miami made life miserable for Simmons at the rim, and he ended up shooting 5/13 from the field as a result. But as most people have figured out by now, Simmons does not have to be a scorer to take control of a game. He plays with such a serene calmness that it's almost unnerving, and if you show him a crack in your defense he is going to split it open like a soggy watermelon. "I don't need to take all the shots," Simmons said after the game. "I've got guys who can hit shots. So as long as I'm getting them open and good shots we're fine." The blinding green light Philadelphia's shooters have is partially a product of playing with someone like Simmons. He is pass-first through and through, and unlike with a different sort of star player, they don't have to worry about getting passed over if they miss a couple shots. Simmons is going to keep searching for his guys, and the confidence that is inspired by that mentality is hard to put a price on. A lot of the conversation coming into the game from a national perspective was centered around how Miami would defend Simmons. There was little consideration for the fact that teams have tried to play him differently all season and none of them seem to be working that well. Typically you'd expect sagging off a shooter to cause crumbling of the offense, and it certainly hurts the Sixers to a degree when teams do it to Markelle Fultz. Simmons is able to get away with it because if you let him lord over the court at the top of the key, you are clearing his vision and allowing him to use his greatest gift as a basketball player. Drop guys into the paint at your own risk. Interestingly enough, the Heat used a lot of their smaller, quicker wings on Simmons most of the night, from Josh Richardson to Winslow to Dwyane Wade. None of those matchups really worked out for Miami, and it was a little puzzling to see them get away from the James Johnson matchup they had success with during the regular season. Keep an eye on those trends for game two, because this doesn't seem likely to hold up. While everyone can appreciate a good-old fashioned offensive showcase, there is a soft spot deep in my heart for the players who come up with 50-50 balls and refuse to let a potential opportunity go to waste. When you put Saric and Amir Johnson on the floor together, there is probably not a frontcourt in the league who can match them in flailing elbows, dives to the hardwood, and second-chance plays that their teammates benefit from. With Richaun Holmes all but out of the rotation in favor of the four-out lineups around Simmons, Johnson was asked to shoulder pretty much all of the "true five" minutes for the Sixers. It will come as no surprise to many of you that he struggled from the field (1/7 from the floor), but Johnson was a massive +22 on the evening, and it was absolutely a reflection of how he carried himself on the floor. Midway through the fourth, there was a sequence that embodies how the two bigs get their work done. An offensive rebound off a missed free throw resulted in a jump ball for Saric, which led to another Sixers possession, an offensive rebound that tipped from Saric to Johnson, and eventually, at the end of it all, a three for Saric on an assist from his frontcourt partner. It doesn't always look pretty, but nobody is going to outwork these two. I asked Johnson about how they always seem to pop up in the right spots at the right time, and he insisted it's about effort and attention more than anything. "It's just something on the court where it's not a play call, it's just being relentless," said Johnson. "Me and Dario have the mindset, okay, let's go try to get these rebounds, we know we're going to have our guards back in transition. It has to be the mindset even if you're dead tired ... you got to box out one of us. We're at least going to get a tip out or somebody's going to get a hand on a rebound." We'll discuss Saric and another mainstay of the franchise at length later today. In the meantime, take a moment to enjoy the Process playoff era kicking off with a near 30-point win.